Adverbs qualify verbs, adjectives, or other adverbs. 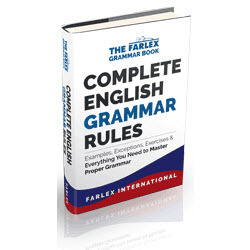 A traditional rule of grammar says that the adverb should follow, rather than split, the infinitive of the verb in sentences where the adverb modifies the verb. This issue has created much attention over the years. Writers who know little about English grammar seem, however, to be aware of the rule that infinitives (e.g., to go) should not be split by an adverb (e.g., to boldly go). Nowadays, most grammarians and linguists will agree that this rule is not absolute, and that there are many situations in scientific writing where splitting the infinitive actually makes sense. Again, meaning is more important than rigid adherence to useless rules. ^ Grammatically correct: It is the investigator's duty to inform the patient fully before initiating the therapy. Preferred because the meaning is clearer: It is the investigator's duty to fully inform the patient before initiating the therapy. The first sentence is grammatically correct in that the infinitive (to inform) is left intact. In the second sentence, the adverb "fully" splits the infinitive but qualifies the nature of the information to be provided to the patient. Although we are breaking a rule of grammar, the second sentence simplifies the meaning and is therefore preferred. ^ Grammatically correct: The laboratory listings were screened carefully for any values above or below the defined normal ranges. Preferred because the meaning is clearer: The laboratory listings were carefully screened for any values above or below the defined normal ranges. Table 4.10 shows other examples where placing the adverb before the verb makes sense. The hypothesis was confirmed definitively in all instances. The hypothesis was definitively confirmed in all instances. The study was designed specifically to meet this goal. The study was specifically designed to meet this goal. The causative organism was identified unequivocally. The causative organism was unequivocally identified. Q If the adverb strongly qualifies the verb, i.e., if you wish to place special emphasis on the nature of the action, it is legitimate to split the infinitive.